Are you passionate about the Richmond Region history? Do you believe in the power of Richmond’s stories? Join us for the Richmond Ambassador Academy, presented by Richmond Region Tourism and the Valentine. 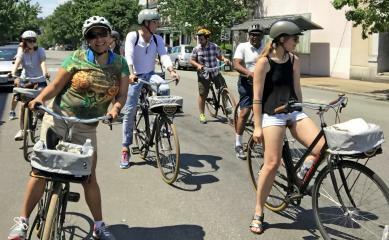 This FREE, six-week course will provide you with the skills you need to plan, create and execute engaging Richmond history tours. As a member of the Richmond Ambassador Academy, you will gain a strong foundation in Richmond history, a greater knowledge of the connection between the Region’s past and present and an understanding of this dynamic field. Participants will leave with a skill-set perfect for the local tourism industry and an endorsement from Richmond Region Tourism as an Ambassador Guide. I Am Tourism Ambassador Training. Have not attended an I am Tourism Ambassador Training? Register here for upcoming class. Class will meet on Sundays from 1-5p.m. First class meets at the Valentine, following classes will meet at special sites throughout Richmond. Attendees should commit to attend at least five of six classes prior to registering in order to earn the Ambassador Guide endorsement. Please note, course curriculum includes site visits and tours (museums, historical sites etc.) and weekly walking tours 1-2 hours in length. Classes will involve walking and standing. If you need any special accommodations for walking tours or site visits, please let us know. Registration for Ambassador Academy is first come first serve and space is limited. Once the class is full, a waitlist will be available for interested participants. Waitlisted individuals will be notified after the registration deadline (February 24, 2019) should a space become available, and will receive early registration notice and first right of refusal for the next course. Cancellations must be made by February 24, 2019. Please note if you do not cancel in advance or attend, you are responsible for a $25 no show fee. Click here to register for the I Am Tourism Ambassador Academy!